Ramon Llull (1232-1316) was a layman, married with two children. He wrote more than two hundred and fifty works in Catalan, Arabic and Latin. He was the first writer in Catalan to use it as a literary and philosophical language at a time when Latin and French were preferred. 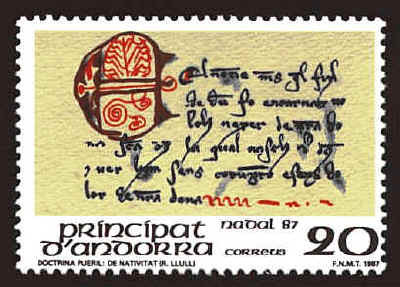 The stamp, issued in 1987, shows an initial from a manuscript of Libre De Doctrina Pueril in Catalan.